The second in a series of fold-out concertina gift titles that tell world-famous stories in 16 panels, illustrated by American artist Yelena Bryksenkova. Every title in this series is like a visual 'spark notes': a learning tool that simplifies plots into bite-sized pieces, and doubles as a beautiful piece of freestanding art to shelve or frame. 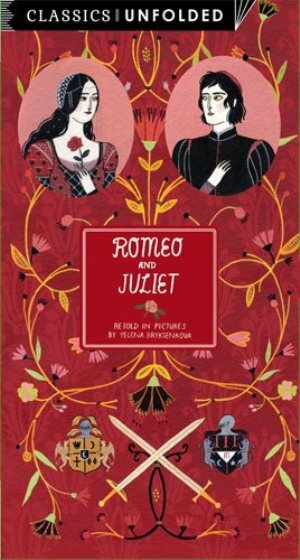 Romeo and Juliet visualises William Shakespeare's tale of two star-crossed lovers from different clans, whose love has tragic consequences.